Cooking – Page 2 – Tri. Hack. Eat. 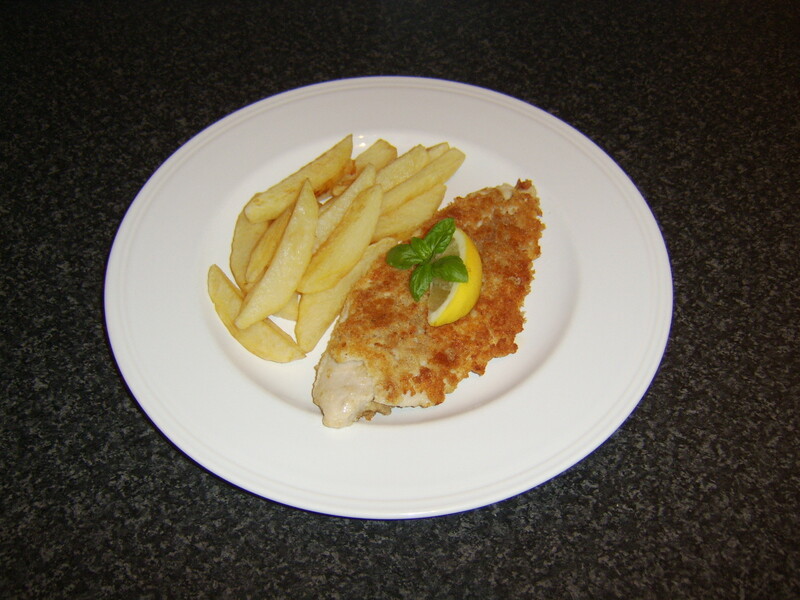 The other substitution I made was adding Buckwheat Flour which I use in some other recipes as well. The batch I made turned out really well however I’ve yet to figure out how cafe’s and grandparents get that great moist non-crumbly bread, but when I do I’ll be sure to write about it. UPDATE: So it turns out that by placing a casserole dish of hot water on the rack below the bread pan in the oven largely solves this problem! One word of warning, combining the Oats and Buckwheat flour is potentially disastrous if you plan on consuming large portions of a loaf at one time. Both ingredients contain huge amounts of fibre and have the potential to make you quite regular if consumed in large quantities. Pour wet ingredients into large mixing bowl containing dry ingredients and mix thoroughly. Grease your bread pan, pour in the mixture and bake for 45-50 minutes. As well, place a casserole dish full of hot water on the rack below the bread pan for more moist banana bread. Alright so I thought I’d post this great recipe I have for burgers while I have a moment. This recipe makes about 6 large chicken burgers and contains a bunch of vegetables. 1. Dice the onion, pepper, mushrooms, grate the carrot and crush the garlic into a large mixing bowl. The finer you chop these things, the easier it will be to make the burgers and the better they will survive on the barbecue. 2. Scramble two eggs in a bowl and add them along with the ground meat of your choice and the olive oil to the vegetables. I recently started adding the olive oil to the burgers and it seems to make big difference in the tops/bottoms not sticking to the barbecue and also helps stop the burgers from drying out and crumbling. Now mix thoroughly until everything appears to be evenly distributed. 3. Add the bread crumbs and mix again. From here you might need to add more bread crumbs if it appears that your mix is kind of runny. 4. Make patties out of the mixture. 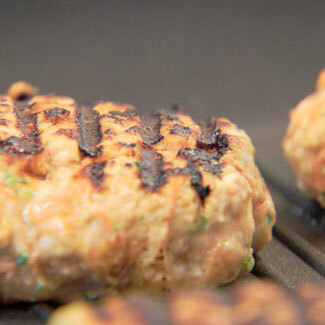 I normally just kind of wing it and make them like you would a small packed snowball, but here is an interesting link I just found that I need to try next time I make burgers. 5. Put patties in the freezer for 10-15 minutes. This helps your patties to stick together I find. 6. You can pan-fry them if you don’t have a barbecue but you need to do it on really low heat so that the centre of your patties get cooked. If you are using the barbecue, I generally try and get it as hot as possible before putting the burgers on then, cranking the heat all the way back. This is so that the burgers don’t burn to the grill which has happened to me a couple of times. I generally flip at about 7-8 minutes or once the burgers seemed decently brown on one side and won’t crumble apart. Then I let them sit for about 10-12 minutes on the other side until the other side is browned or crisped as well. 7. Serve how ever you like. I normally serve them on a bun with spinach, sliced red onions, and Sweet Chilli Mayonnaise on the bottom, then Teriyaki poured over the burger, topped with tomatoes. If all goes well, they should look something like this! Another cool looking recipe I found while searching for pictures, were chicken rissoles. The idea of brown rice and sweet potatoes in a burger sounds very appetizing and healthy definitely might have to try it out! I also think I’m going to try and make super chicken burgers by combining rice, sweet potatoes, chickpeas, and quinoa with my normal mix. Not sure if it will work yet! To my great surprise and enjoyment last night, my professor cancel my 9:30am lecture. After a glorious sleep, craving pancakes I set out to make my favourite recipe. If you haven’t heard of the The Joy of Cooking, it is one monster of a cookbook(1200 pages) that has recipes and techniques for almost anything under the sun including skinning a rabbit and then making a tasty stew out of the little critter. The only downside of this cookbook is that the recipes often call for multiple pounds of meat, cheeses, and other non-practical and expensive ingredients which is true of most non-vegetarian recipe books. Sundays during the university school year are great. Being a huge Dallas Cowboys and NFL fan in general, there is nothing better than waking up bright and early, making a big breakfast, drinking coffee and watching my favourite team play. Naturally when I flipped to the pancake section in the Joy of Cooking I was pleased to find 10 different pancake recipes alone. 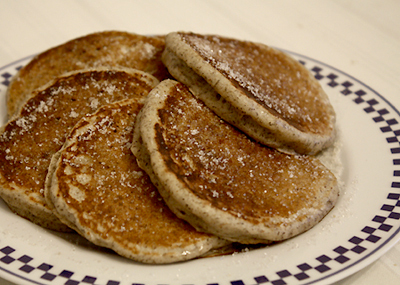 The one I seemed to have settled on however is the Buckwheat pancake recipe. Side note: I just realized on the Bulk Barn website you can look up nutritional value for all of their products! Despite it’s misleading name and much to my surprise, Buckwheat is a relative to Rhubarb and is not actually in the grain family. This is great news as it is a great substitute for people who are sensitive to wheat or other grains that contain protein glutens. 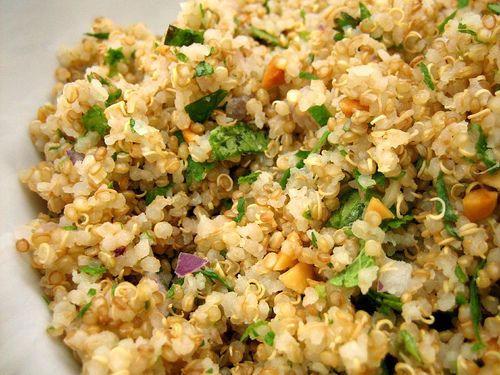 Even more good news, Buckwheat contains all 8 essential amino acids making it a “high quality” protein and is also high in dietary fibre as well. I do not claim to be an expert in food science or even in Biochemistry, but here are the basics about Amino Acids from what I’ve researched. Amino acids are the basic building blocks of protein which are used in various biological processes in the body. Although there are 22 in total, there are 8 which are considered “essential”. An essential amino acid is one that cannot be synthesised from other available resources, and therefore must be supplied as part of the diet. The other 14 can therefore be created from these 8. The next term that is important to understand are foods that are considered “complete proteins”. As you may have guessed these foods are considered to have the eight essential amino acids necessary to the body. Foods such as cheese, Quinoa, eggs, fish, lean meat, and milk are all examples of these. 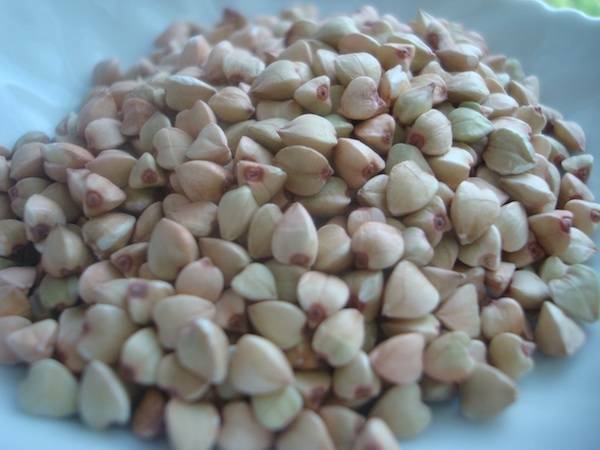 Finally we have foods such as Buckwheat which have all 8 amino acids but are considered “high-quality” proteins. Naturally I was confused how something could contain the essential amino acids and not be considered a complete source of protein. It turns out that in order to qualify as complete, a source of food also needs to have what is considered an adequate proportion of each amino acids for supporting biological functions in the body which makes sense. Mix dry ingredients in one bowl, mix wet in another, combine and stir well. Tip: I always used to mess up the first batch of pancakes I put in the pan. The secret I have found is to first, buy a good frying pan. Next you want to preheat the frying pan with about 1.5 Tbsp of Canola Oil in it to about 6 out of 10 using your burner’s knob setting. Once your frying pan is nice and consistently hot, use the tip of a piece of paper towel to spread the Canola oil evenly over the frying pan similar to greasing a muffin pan or banana bread pan. I like to do this after the pan is hot so you don’t have excess Canola Oil in the pan. Once you have done this then add your pancakes. Buttermilk is a type of milk that is thick and acidic. This acidic property, when mixed with flour causes a reaction(that I don’t have the knowledge to explain) which basically enhances the texture of your baking. The good news is you can make buttermilk at home using lemon juice and milk from the fridge. Normally I use a measuring cup capable of holding at least 500ml of liquid to accomplish this. To make buttermilk, simply pour 1 Tbsp of lemon juice into the liquid measurer for every cup of buttermilk you need to make. Next fill to whatever cup line you need with milk. Do this before you start mixing any other ingredients as the acidic lemon juice takes time to curdle the milk and give it that thick consistency. Some other things I like to do to make my pancakes to make them more interesting is to either add chopped banana and/or melted peanut butter. Also, I hope to find a usb to micro cord for my camera so I can actually take pictures of what mine turn out looking like.